-Dark mode: Here you can select a darker theme, for those times when you want the screen to not glow too bright. The dark mode affects the main grid view and the news item preview view but not the web browser view. 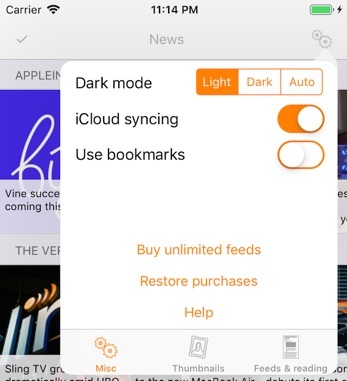 “Auto” uses the current screen brightness to decide when to use dark (low brightness) or light (high brightness) mode. -iCloud syncing: Here you can switch off synching of your feed list using iCloud. Note that read items statuses are never synched; I’m not sure it would be a good idea to do that, and also there is a restriction on the data size allowed for synching preferences using iCloud which would necessitate read item statuses to be synched in a different, much more complicated and error-prone way. Hence, no synching of read status. -Use bookmarks: Switch on if you want to use the bookmark functionality. Note that iCloud syncing also needs to be switched on for this to work. You can also buy unlimited feeds from this view or restore your purchase of unlimited feeds (if you are setting up a new device); once this has been done, the buttons for buying/restoring will no longer be shown. There are also buttons for a repeat showing of the internal help pages which were shown on the first start of the app. -Display thumbnails: Controls whether you want to see thumbnail images in the boxes in the main view or not. -Quality: Showing thumbnails might require a lot of memory, so here you can control the quality of the shown images; of course, for minimal memory impact you can also switch of the thumbnails completely. 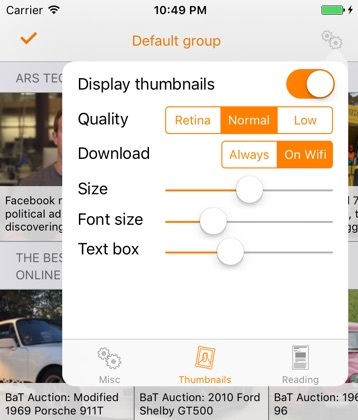 -Download: Showing thumbnails might also require quite a lot of bandwidth so here you can control whether to always download thumbnails or only doing so when on Wifi (so for devices without cellular data, this setting doesn’t matter). -Size: The grid size in the main view. -Font size: The size of the font used in the preview text atop the image for each item in the main view. -Text box: How big part of each item in the main view should be reserved for text. -Font size: Here you can set the font size to be used in the preview view for news items. 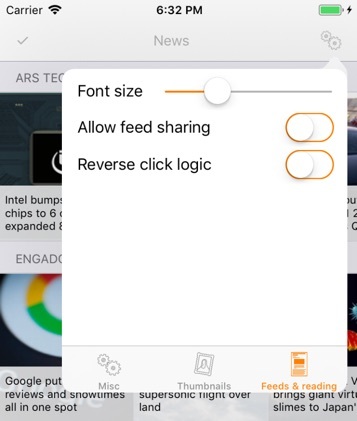 -Allow feed sharing: If enabled, the feed URLs you’ve added to the app will be used for creating suggested list of feeds for users. This is completely anonymous; I’m not interested in advertisements and similar, and just want to be able to give especially new users some good feeds to pick from. -Reverse click logic: If enabled, the long-click and short-click in the main view will works the opposite way. I.e. regular clicking will take you to the web view, whereas long-click will take you to the preview view. -Fullsceen preview: iPad-only, this enables you to open the preview view in fullscreen mode instead of the standard popup mode. For advanced users which e.g. use launcher apps, Heartfeed supports a custom URL scheme: heartfeed://. This scheme has a single use: Opening this URL, you will switch over to the Heartfeed app. In the future, the scheme might be extended for other uses but as of right now, this is the only supported usage.